I was in Philly last week/weekend for work. As always, it was a lot of WORK… but I managed to squeeze in some fun. 1. 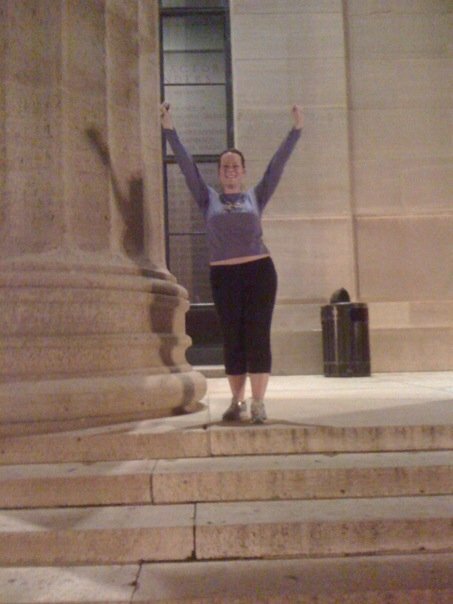 Run the “Rocky” steps at the Philadelphia Museum of Art–check! Afterwards, I tried running back to my hotel… and got lost (shocker!). I probably got an extra 2 miles of running in + an extra 3 or 4 walking. Navigational FAIL! 2. 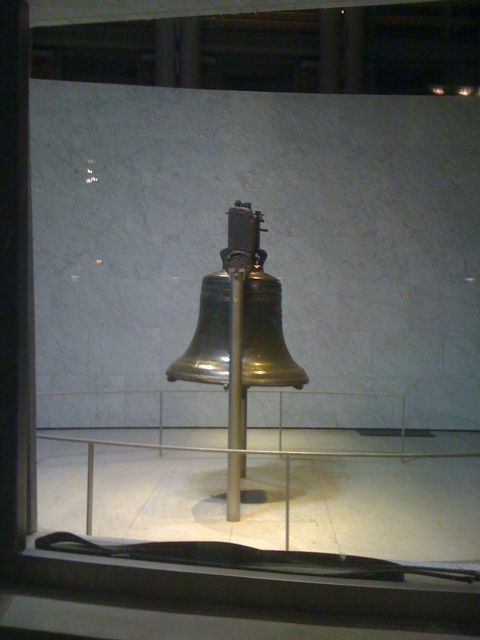 See the Liberty Bell–check! 3. Sample an authentic Philly cheesesteak– check! You’ve probably heard of the famous rivalry between Genos and Pat’s– two steak stands in South Philly who vie for the title of “best” cheesesteak. After our work was done, a colleague and I took a cab to sample the goods. 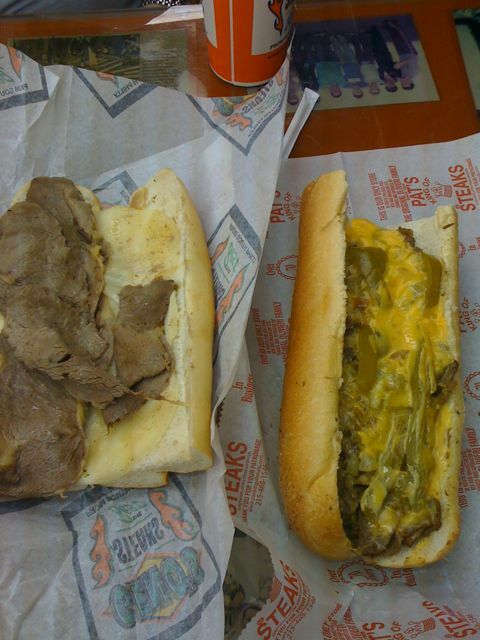 She got a *very* plain sandwich–steak and provolone only–from Genos and I got a pepper steak “with” + Whiz from Pat’s (that’s cheesesteak lingo for a cheesesteak with peppers and onions and, yes, Cheese Whiz). Mine was better. Not only did mine have the delicious goodness of the peppers, onions, and cheese whiz, the meat and bread of mine was tastier. Pat’s wins… hands down. 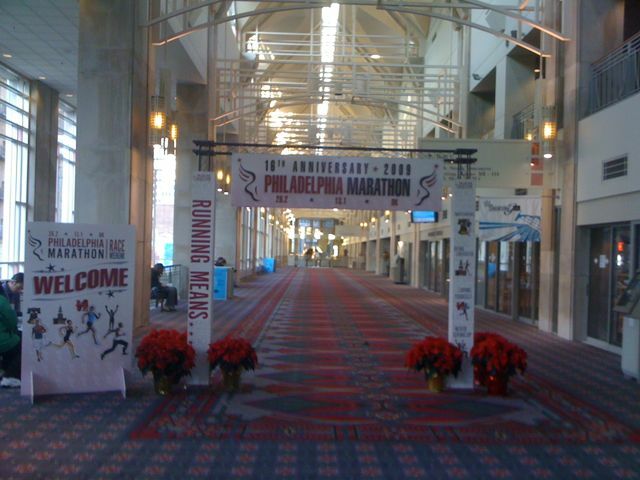 entrance to the Philly Marathon expo--literally steps from our own exhibit hall entrance! I also shared many dinners, laughs, drinks, and good times with my work buddies. Putting on these shows is kinda like camp– you bond instantly with your co-workers. Except it’s really hard work and we’re all tired and cranky. But at the end of the day, it’s nice to have a good group of people to commiserate with! It’s been almost two weeks since I’ve blogged. In fact, I’ve only blogged once this month. Shame on me. A lot has happened in that time and I can’t even begin to remember it all. So you’ll be getting updates in a non-linear fashion. Hope you all can keep up. I had my first Physical Therapy appointment today. You might recall that I hurt my hip running and the doctor ordered me to run on it so I could be in some pain. I did. And I was. He determined that my pain wasn’t really my hip at all. It is enthesopathy (inflammation) of the lower abdominal muscles (read: I have weak abs, no surprise here!) He prescribed physical therapy 2x/week for 6 weeks. My appointment today was a lot of assessment, but I think I’m going to like it. They did this cool electrode thing where they put two pads on my skin and connected them with wires that looked like mini jumper cables. It’s supposed to push the medicine into my system instead of having to give me a shot. Score. The physical therapist was really nice and she’s training for a half-marathon in February, so we talked about running. She also gave me some ab exercises to do at home. If nothing else, at least I’ll get some core work in. It might be expensive, but it’s sorta like having a personal trainer, right?? I went to the Sports Medicine doctor today. He *ordered* me to run tomorrow. Yay!! Bad news is that he ordered me to run so that I would be in enough pain for him to assess the hip injury. Good news is it’s absolutely not a stress fracture. I’ll probably just do my usual 3 mile loop. And maybe I won’t even make it the whole way. But I’m excited to give it a try!